Political drama, a feminist element, a small cast and a fiery female lead make a much-performed play. Ariel Dorfman's script is set in an unnamed country. Call it Chile, but it could be anywhere. The characters are from the intelligent, articulate class, aware of what a dictatorship is doing. Like Macbeth, it is also a Mars versus Venus play, with male dominance brought down by the female. Lynda Phillips, as the woman who thinks she recognises her former torturer, in a man her husband brings home, gives a performance with every nerve-ending exposed. 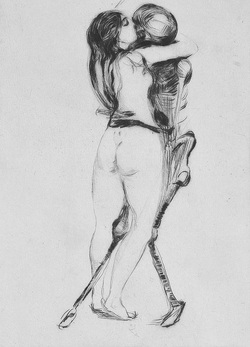 Her trussing of his unconscious body, in a replica of her own former plight, is electric theatre. It is the woman's play; but the men hold their own. You cannot be sure if the tables have been justly turned on the supposed ravisher or not. Thus Phil Ling elicits some sympathy in being bound, gagged and threatened with a gun. He is able to retain a dignity under duress. Rob Backhouse, in a rather underwritten part, still evokes the husband's quandary of emotions. Directed by Steven Phipps, the evening has the grip of a torturer's electrode. Saw this play last night at Eye. Really loved it. A cleverly-wrought play both dramatic and thought-provoking, in the hands of very good actors, well directed. Very real characters were given us - we felt their feelings and all the tragedy underneath – with good diction so that they were able to vary volume as the play and the small hall required or allowed. I was particularly impressed at the ingenuity displayed by this travelling amateur company in making so much of the bare resource of a very small corner-positioned stage: they intelligently contrived two entrance points in addition to the original one, and used fully both sections of the auditorium's floor facing the stage edges. It all seemed a wholly different place from the stage I knew from performing there on other occasions. Technicals all good. I would perhaps have wanted a clearer deeper dim of the light between scenes; but perhaps the sun was getting in? Anyway, that's the only adverse criticism I can dream up! – the rest was all so bloody good! Thank you, Mustard! May you go on and thrive and continue to bring us these riches. The idea of exploring and expressing some of the harsh and difficult emotions and human weaknesses implicit in this play interested me and took us all on a hard journey. We have scant idea what it must be like to 'learn' what democracy feels like and the fear and uncertainty that that scenario may bring. The several moral dilemmas in Dorfman's play explore doubt, belief and trust; the pull between love and political expedience and the physical and mental damage that torture and captivity brings. Duty and care are also themes that should occupy our thoughts here, each character has their own weight to bear. The fine line, but massive divide, between psychosis and lucid truth give the play a dangerous edge. 'Compromise' with its dual meaning weighs heavy in these character's lives. The subtle ambiguity of the plot should make us all think harder and question everything. “Speak out, and there is no denying. When you hide the truth there is only fear and lying”. Mustard Theatre Company brings you Ariel Dorfman’s masterpiece “Death and the Maiden”. It is a story of love, of constancy and of political expediency, told to a world where there are no answers, only more and more questions. In an unnamed country newly free of dictatorship, Gerado Escobar is late home from his meeting with the president. Paulina, Gerado's wife, waits with that mix of dread and hope that only survivors of torture know. Were it not for the generosity of Dr Roberto Miranda, who drove him home, Gerado would probably still be beside his broken-down car. But Paulina is certain that Roberto's voice sounds like that of the doctor who supervised her torture. So convinced is she that she lashes him to a chair to interrogate him. Has she finally become unhinged? Has Dr Miranda an unacknowledged past? Gerado will have to decide whether to put his wife's need for justice above his own ambition to lead his country's reconciliation with its past.